Professional musicians like this are finding work harder to come by since the economy went sour. It may not be music to your ears when listen to your community orchestra at the park this summer. The economic downturn is forcing professional and community orchestras alike to cutback on rehearsal time, shorten their schedules and scale back productions. David Wroe, the Westfiled Symphony’s conductor in New Jersey, told The New York Times he worries audiences would pick up on the hesitancy of under-rehearsed, overcautious musicians. Musicians who make their money playing in professional orchestras in and around New York City are having a hard time making ends meet. Side jobs are drying up for Broadway musicians and substitute jobs have become harder to find. “It has forced me into a part-time, hand-to-mouth existence,” Gabriel Schaff, a violinist, told The New York Times. 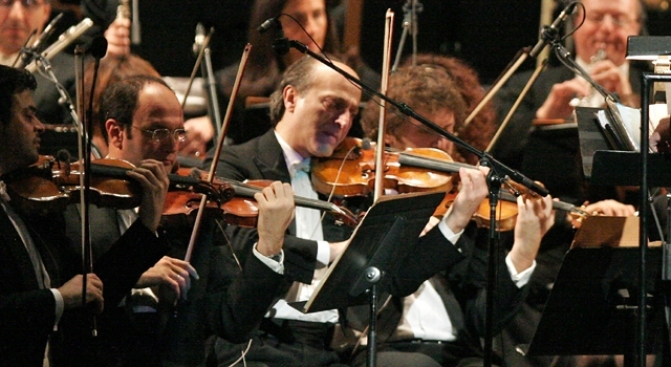 Most orchestras are offering less work because of funding problems. The Opera Ochestra of New York cancelled two remaining shows this season at Carnagie Hall because of a lack of funding. “We regret the need to take this action, but feelit is the most responsible action to economic climate," Chairman of the Board Norman Raben said. Small orchestras in the suburbs that use professionals have also had to tighten their belts. Community orchestras in Long Island, New Jersey and Westchester often perform at local parks on the weekends throughout the summer. The orchestras are typically made up of amateurs who work for little to no compensation. However, they often employ paid "ringers" to fill out certain sections of the orchestra. The harsh economic climate may force them to cut back on the hiring of professionals, or worse, cancel shows.